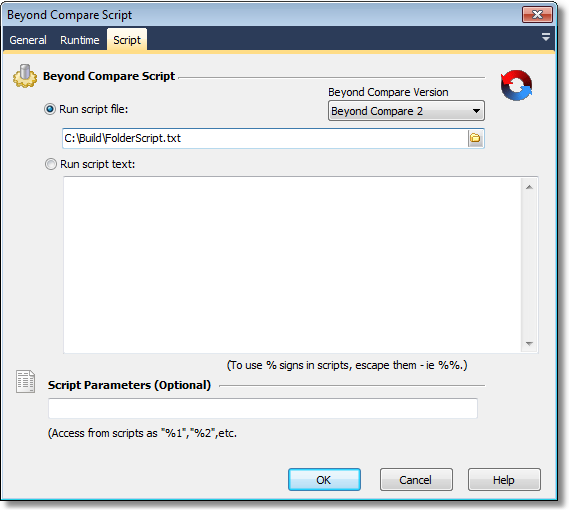 The Run Beyond Compare Script action runs a script which has been created with the Beyond Compare scripting language. Among other things, this scripting language allows you to automate Folder Compare behaviour. See the Beyond Compare Help for sample scripts and a Beyond Compare scripting reference. To run a script which has been saved in a file, enter the path of the file here. Alternatively, you can enter a script in the dialog shown. The script will be written out to a temporary file at runtime. Note that you can use FinalBuilder variables in the script by using the % syntax. If you want to use % signs in the script itself, escape them as %%.